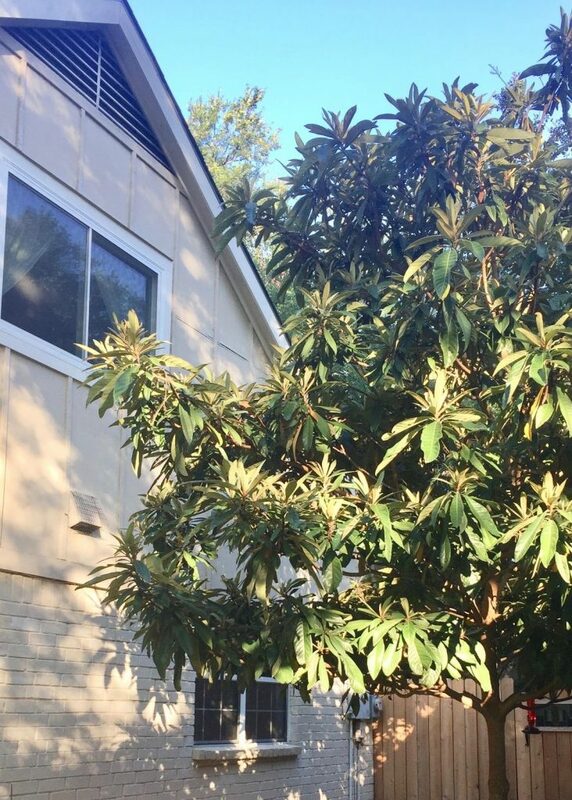 It’s been about twenty years since I last stood there, but I can still picture the loquat trees along the east side of my grandmother’s back yard in San Antonio. I think there were four or five of them. All were pruned into tree-form, and planted in a straight row. Loquat trees are beautiful tropical-looking evergreens. They bloom in the winter, when not much else is flowering. As such, each year, their flowers are sought-after by vast numbers of bees. The trees produce abundant quantities of small orange fruit in late spring. The loquat fruits are delicious, and not quite like anything else. Each fruit typically contains three to four large seeds, which result in a multitude of seedlings that sprout under each tree. My grandmother was a child of the depression, and thus tolerated no waste. Though she was vexed by how to appropriately dispose of them, she felt obligated to have the man who tended her yard, dig up and pot the many seedlings. When my husband and I bought our first home in 1994, my grandmother happily gave us two of these. I planted the trees on the east side of our first house. One was lost in a harsh winter. The other remains next to that home today, and now well exceeds its one-story height. When we moved in 2005, naturally I dug up and potted several seedlings from under my loquat tree. One is now in my sister’s yard, where it provides year-round privacy from an adjoining property. Another was given to a friend who delights in filling his yard with fruit-producing trees. One is happily growing in my back yard. But my favorite is the one that my daughter and I planted below her bedroom window. It has grown well over the years, and now seems to peek in her second-floor window, looking for the little girl who has grown up and gone away to college. Loquat trees produce fruit more reliably in San Antonio than they do in Austin. Here, cold snaps will sometimes prevent the fruit from setting. So, it is not every year that I make jelly from the fruit. However when I am able to, I do. I know my grandmother would be pleased. When I was asked what makes me “Texan by Nature”, I thought of my favorite loquat tree. It connects me to my grandmother, who lived all of her 102 years in Texas. It reminds me to emulate her by not tolerating waste. It connects me to my children, all three of whom were born and raised in Texas, and who grew up eating loquats straight from the tree. And it reminds me that trees and bees and fruits and family all make me feel peaceful and happy.